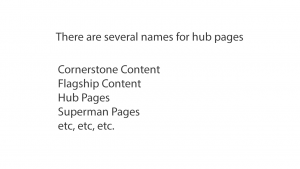 Cornerstone Content is based around a hub PAGE, not a blog post. That connects or groups together all of your content on the topic covered by a specific keyword you want to rank for. Your Cornerstone Content page is the only page or post on your site that targets exactly your chosen keyword string. 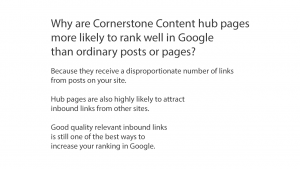 Because you don’t want other posts or pages on your site competing with, detracting from and reducing the SEO power of your Cornerstone Content page. Google lists the single most useful web page it can find to answer to each search query. 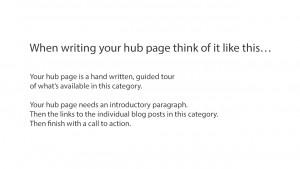 If your topic is too big to fit on just one page you can build a hub page. A hub page links together all of your most useful information on one particular topic. Think of a bicycle wheel. The most important part is the hub, in the center. But a bicycle wheel won’t work without the spokes reaching out and connecting to the wheel rim. A Cornerstone Content page is like the hub of a bicycle wheel. 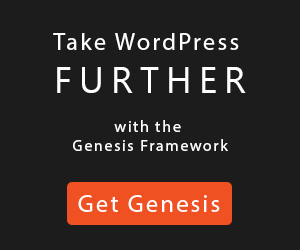 It links out to and connects with other important blog posts related to this particular Cornerstone topic. 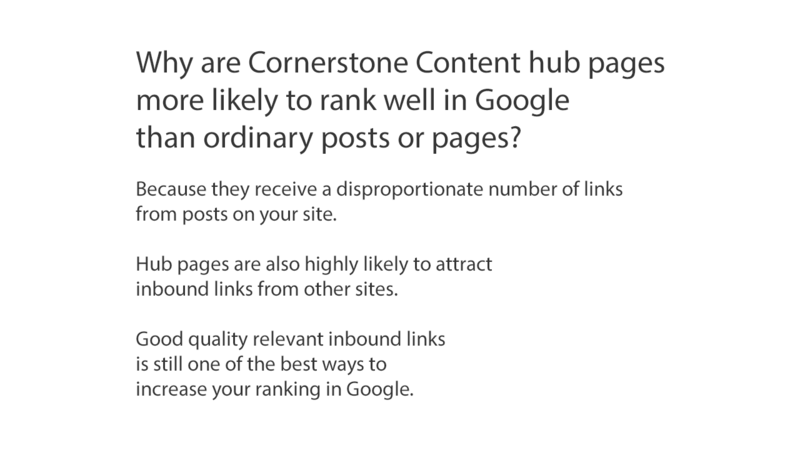 This means that when someone lands on your Cornerstone Content hub page, they can immediately see that this is a central resource or central hub of information. But most importantly, they can see this information is useful to them and is relevant to the search they made in Google. 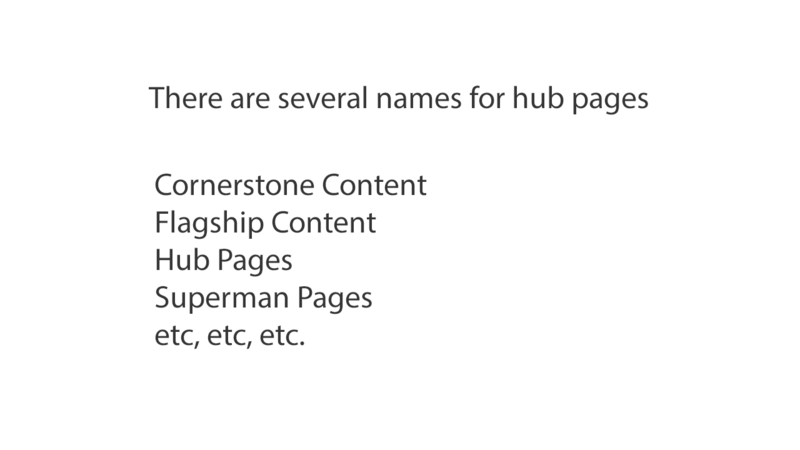 If you want to rank for several highly competitive keywords, you could build several of these hub pages. 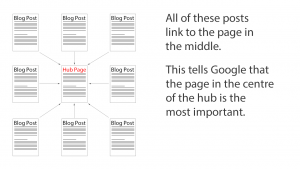 You link from your hub page to blog posts on similar and related topics. 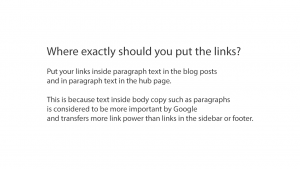 But you also link from those related blog posts back to the hub page. Cornerstone Content pages are some of the most important pages on your site. So make sure you have lots of prominent links scattered around your website that visitors will come across as they read your posts and navigate your site. Anywhere else that you see fit. 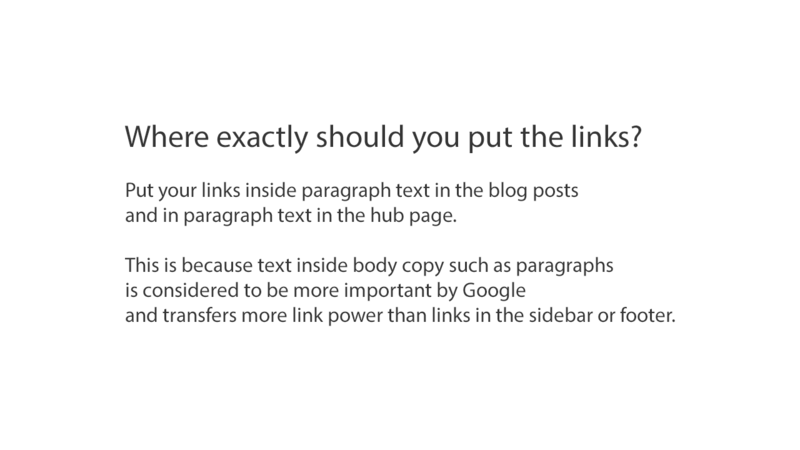 And remember, links in the body copy of blog posts are more powerful than links in the footer or sidebar etc. 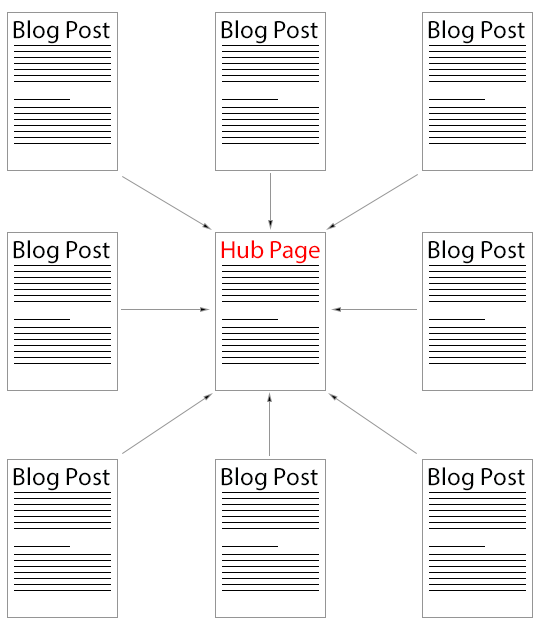 You need one single page that is the center of the content about that topic. One “hub” page, if you will. 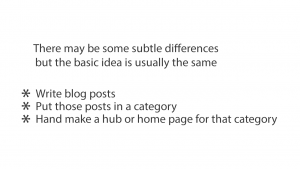 Start a new blog category based around an evergreen topic that is useful to your clients. Find a topic that is likely to attract people who are in buying mode not looking for freebies. 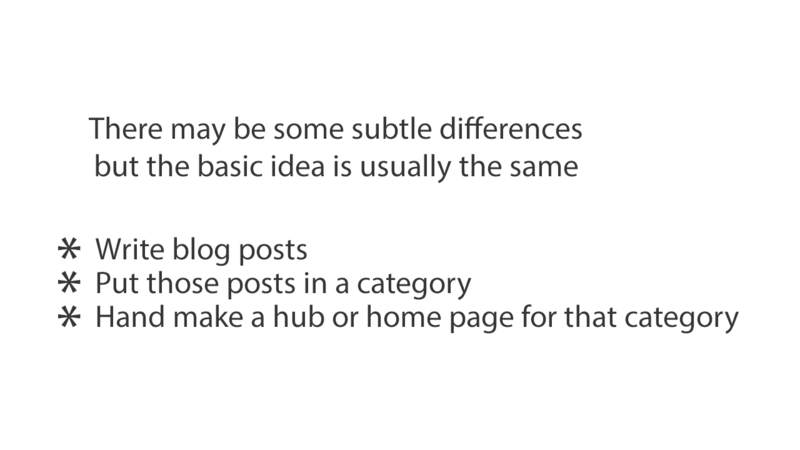 Then start writing blog posts you can use as part of your Cornerstone Content. Look through your old blog posts and try find a collection of related posts that you could organize into a piece of Cornerstone Content. 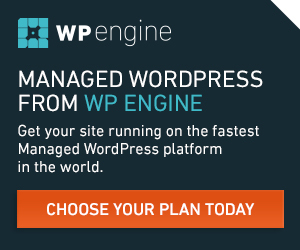 Yoast has a good way to do this. Start that page with an introduction explaining that this is a hub page that links to many other posts on closely related topics. 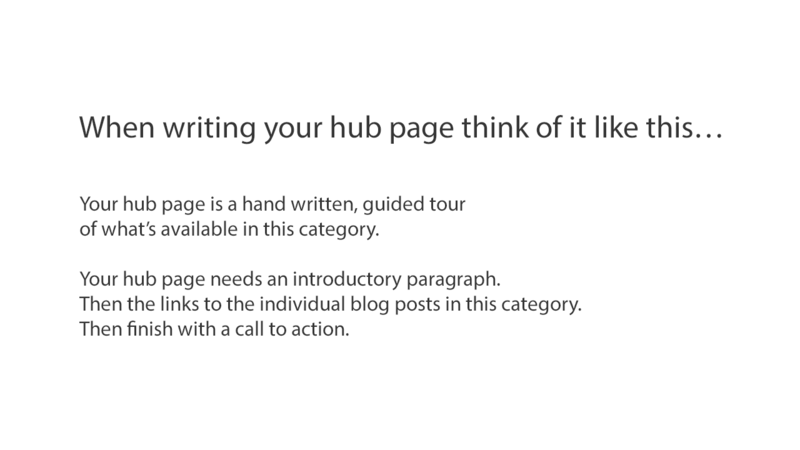 Following the introductory section at the top of your hub page, write a short summery for each blog post you will link to from this hub page. Make it as easy as possible for people scanning this hub page, to find and read your other blog posts that are in this category or about this topic. 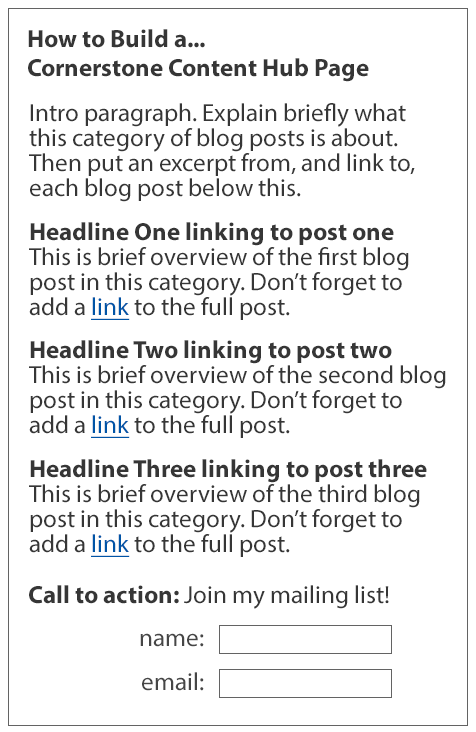 Then finally, when you’ve listed and linked to all of your other blog posts on this topic, add a call to action. 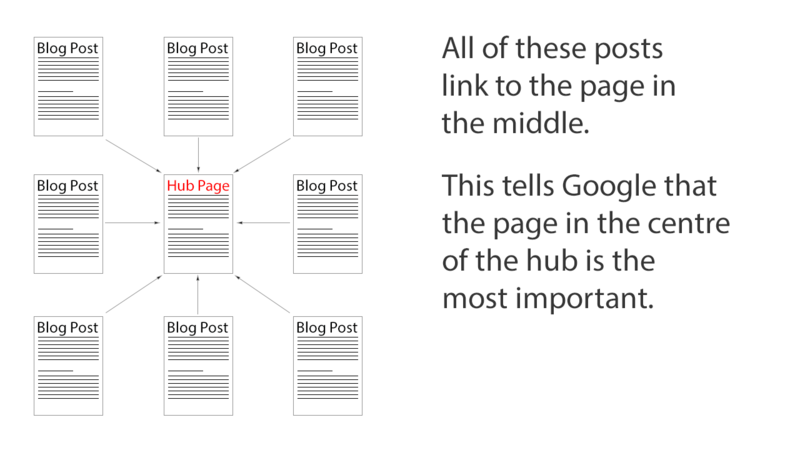 Writing a series of posts and linking them together using a hub page is a serious investment of your time. I assume you have a reason for investing all of this effort. But what is it? Below I go into a bit more detail and talk about some things I found confusing. I hope this will help you understand Cornerstone Content with a faster learning curve than I had. Cornerstone Content, Flagship Content, and Business pages. What terms shall we use? I’ve spent several hours reading about Cornerstone Content, Flagship Content and the basic Business Pages all sites need. One of the most confusing things I found was trying to work out if Cornerstone Content and Flagship Content are in fact two different types of content. Or are they just different names for the same thing. I think they are one and the same thing. So for the rest of this article I’ll be referring to both Cornerstone Content AND Flagship Content as Cornerstone Content. I will call Business pages the basic pages most small businesses have on their website. Some people refer to these essential pages as Cornerstone Content. But for me, that just seems to confuse things. Cornerstone Content is a hub page that acts as a central hub or home page linking to all of your most useful blog posts on one particular topic. 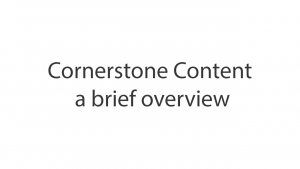 What’s the point of Cornerstone Content? The idea is simple. First of all you write a series of blog posts or articles that are tailored to appeal to your ideal clients. 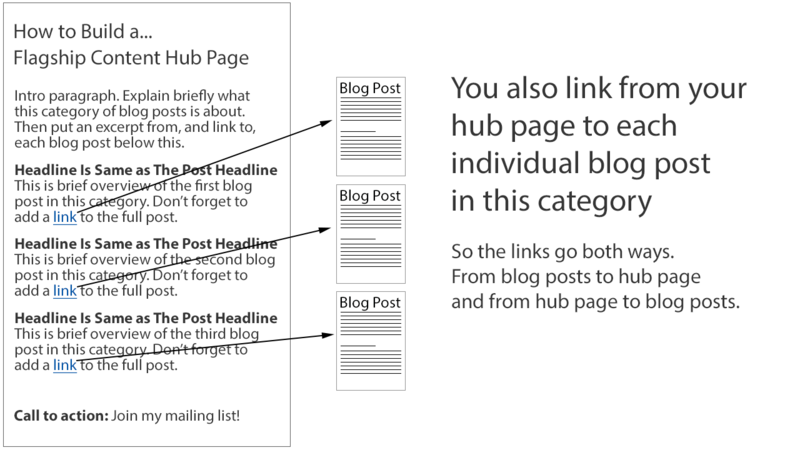 Next you build a single hub page that lists and links to all of these useful blog posts. 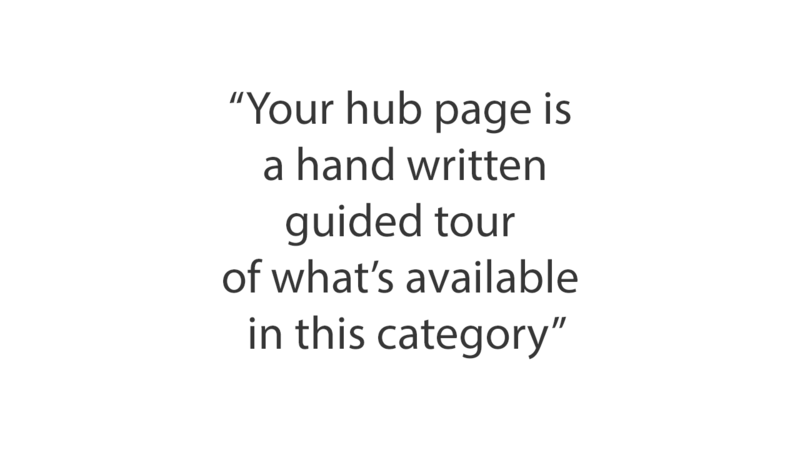 This hub page is in itself a useful resource because it offers a condensed overview of the whole category covered by your Cornerstone Content. Finally, this hub page also links out to the individual articles that explain each individual sub topic in greater detail. Your Cornerstone Content is designed to rank well on Google for search terms used by your ideal clients. 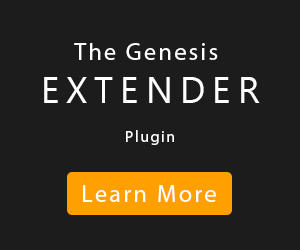 This brings your ideal clients to your website. Your Cornerstone Content should be of such high quality that it proves you know what you are talking about. Which positions you as an authority in your field. By producing a top quality resource for your ideal client base, you are seen as a person of authority. So if your Cornerstone Content is of high enough quality and quantity, you can be seen as THE expert in your field. Being the #1 authority in your field has obvious benefits. You might well find that people want to employ not just someone in your field, but you in particular, and they might be willing to pay a premium to get you. As well as Chris Garret’s book you might find the Copyblogger description of Cornerstone Content useful. You’re going to invest a lot of time into making your Cornerstone Content, so you want it to stand the test of time. Look for a topic that your ideal client base is actively searching for on Google. But try find a topic that will still be relevant in one year, or even five years from now. If your topic is evergreen or is at least slow to change, you will have the time and the enthusiasm to build a truly outstanding resource. Make sure your ideal client is actively searching Google using the search string you are going to build your Cornerstone content around. Have you noticed that I’ve used lots of headlines in this page. I’ve also made the headlines give a brief overview of the subject. So just by scanning the headlines you get a good idea of what this page is all about. If, after scanning the headlines you want to know more, you can read the whole page or just read the sections that interest you. Present your message in the most easy to understand way you can. Put a brief introduction at the top of the page. For each blog post in your Cornerstone Content category, write a custom excerpt giving a brief overview of what you will find if you click the link to that full post. 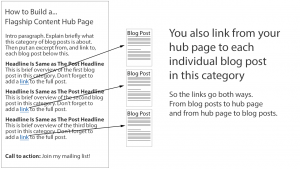 You’ll also need to write an excerpt with a link to each of your Cornerstone blog posts. 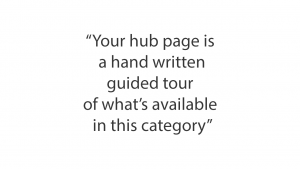 At the bottom of your hub page include a call to action. Encourage them to deliver your most wanted response. For instance contact you for a quote or join your mailing list, etc. Where does the SuperPower come from? If you produce a truly outstanding resource people will want to tell their friends about your site as soon as they find it. They might tweet about your site. Or tell their Facebook Friends. They could even have their own blog and link to you from there. Shock, horror! They might even pick up a phone and tell some about your site. The important point is that, on the internet, good stuff floats. In other words, if your content is good and you get the word out yourself, at least initially, other people will find your Cornerstone Content and tell their friends about it. Previous Post: « Rainmaker Platform – Who Needs It?